25% Off The Source Orb XL 2 Vaporizer is an all new the concentrate Vape Mod by legendary manufacturer Source Vapes. The extremely powerful concentrate vaporizer provides complete temperature control in a compact, solid stainless steel design. The Source Orb XL V2 is currently compatible with over 20 of Source Vapes Premium atomizers. The Source Orb XL V2 includes 3 newly designed concentrate atomizers, featuring the new quad-coil which produces enormous clouds or vapor from long lasting efficient bowls. The Source Orb XL V2 creates premium vapor of with exceptional flavor and potency utilizing the Source Volt Max box with temperature control ranging from 200F and 700F. 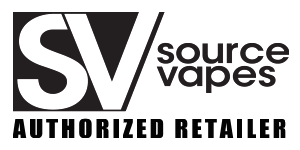 Source Vapes only uses 100% lab-certified Grade 1 which is the purest titanium available for their coils. 25% OFF WITH CODE "SOURCEORBXL2"
PREMIUM SOURCE ATOMIZERS The new Source Orb XL V2 Vaporizer includes 3 various waxy oil concentrate atomizers: The Source Core All-Ceramic Atomizer, A quad coil Atomizer, and the Quartz Coil-less Source Nail Max Atomizer. Each individual concentrate atomizer produces a different type of premium vapor session. Forged from high grade metals, ceramic, and quartz, the Source atomizers are design to extract the essential ingredients produced from wax oil concentrates ensuring that every drop of flavor is enhanced while simultaneously creating clouds of potent vapor. The Source Orb XL V2 works with over 20 of Source Vapes premium concentrate atomizers. PRECISION TEMPERATURE CONTROL The option of variable temperature control in the Orb XL V2 allows the user to zero in on the exact temperature for the perfect vaping session. In addition, variable temperature control allows you to adjust the temperature to the varying consistency of wax concentrate. Concentrates with different consistency vaporize best at different temperatures. Low temperatures produce small, flavorful pull but when the device is set on high temperatures, it produces less flavor, powerful rip with huge clouds clouds. Anyone can enjoy instant rips as the device heats in moments and has a maximum range of 700 degrees making this a portable powerhouse. ADVANCED ORB MOUTHPIECE Crafted of highly durable and beautiful stainless steel 303, the Source Orb XL V2 attachment is user friendly device with a threaded lid which features an adjustable airflow which has five airflow settings. To adjust the airflow, simply twist the airflow ring left or right which will open or close any of the 5 airflow holes. This offers the ability to control the size and density of your rips in a simple way. Source selected a threaded lid design to ensure a solid connection. It is very easy to lady the device. Unscrew the lid, then attach when are done loading the atomizer. The Source Orb XL V2 is backed by a lifetime hassle free warranty.